Alexander Blok wrote The Puppet Show, the first of his "lyrical dramas" in 1906. The play debuted at the end of that year at the Vera Kommissarzhevskaia Theatre in St. Petersburg by Vsevolod Meyerhold who also played the role of Pierrot. The music for the first production was composed by Mikhail Kuzmin. 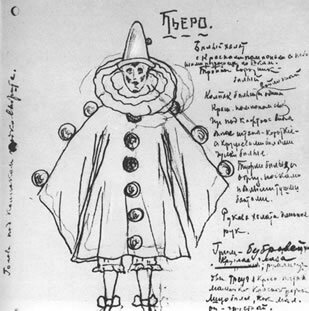 LEFT: The design for Pierrots costume as sketched, most likely, by Fedor Komissarzhevsky. 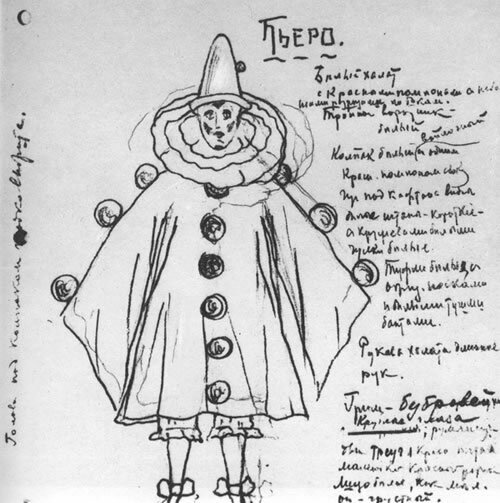 BELOW: Nikolai Sapunov designed the sets and costumes for Meyerhold's 1906 production of Alexander Blok's The Puppet Show. 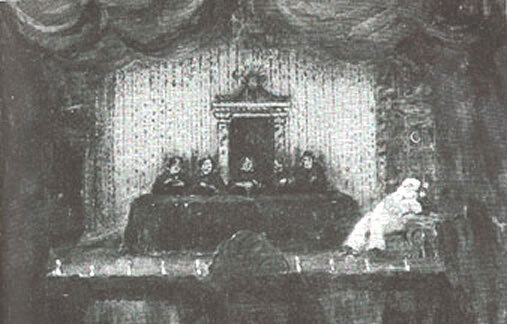 This sketch is for the beginning of the play, and depicts the mystics sitting at a table in the center of the internal stage. In the actual production, cardboard cutouts were used to hide the mystics' bodies, and only their heads and hands could be seen through holes in the cardboard. Pierrot is sitting slumped to the side of the mystics.